Transitions are an enormous part of life, but many of us don’t do transitions well. Celebrations are the fun part of transitions, but it’s important to also give care to the things we are leaving behind. I’ve been thinking a lot lately about how so many life transitions are marked by a combination of ritual and celebration. For example, wedding ceremonies followed by receptions, graduations followed by parties, etc. Because I took an extra year to complete my Master’s program, this spring I am watching many from my cohort transition away from graduate school into full-time practice. As they leave the school it has made me think more about how, through ritual, we can give more care to endings. My school is more than just an educational program, but also a place where significant formation and “story work” occurs. Because of that, most students have a significant relationship with the school and the community it contains. When one of my best friends took her last exam last week, she gave me the gift of letting me guide her through a series of small, mostly informal, rituals to mark the end of her time at school and say goodbye to life as a student. I think the rituals are unfamiliar to most of us, and when we do sense the desire for the meaningfulness given through ritual we often don’t know how to create it. I decided to create this post, and include a rundown of this graduation/goodbye ritual so others might have their imaginations inspired to create their own rituals for similar transitions. The ritual we created was a journey from the chapel in her school, a place of rootedness and rest in chaos, through the significant rooms of the journey, and out the front door onto the street. Because graduations are always kind of a birthing of new life, we started our ritual with planting a plant. The plant represented what she was going out to do, and how leaving the place of learning to enter the work of practicing what was learned is an opportunity for new life to grow. Because I had one handy, we used a few leaves of Syngonium Podophyllum (which are happy to root and grow in a container of water). The vessel of water to the side allowed for a ritual pouring out of the water to nourish this new leaf as it grew into a plant. Presenting my friend with a small metal tin that was lined with felt and scented with an essential oil (as a sensory element to the experience), I invited her to fill it with small bits of reminders of this place as we walked through the building one last time as two students. She collected bits of paper and stone from the chapel, a leaf from a significant potted plant, bits of wood and brick, and a small piece of glass that represented our unique friendship. Before leaving the chapel, I invited her to strike a match and light a candle – which we left burning to represent how part of her will remain present in the community she leaves behind. Outside our chapel, there is a chalkboard wall. Before we met up I placed a bucket and rag at the foot of the chalkboard wall. As a next step in our journey, I invited her to write on the chalkboard wall something that she would like to leave behind in this place, and then wash it away with the wash rag in warm water. Next, I gave my friend a basket of small stones and we walked through each of the rooms that felt significant to her journey. 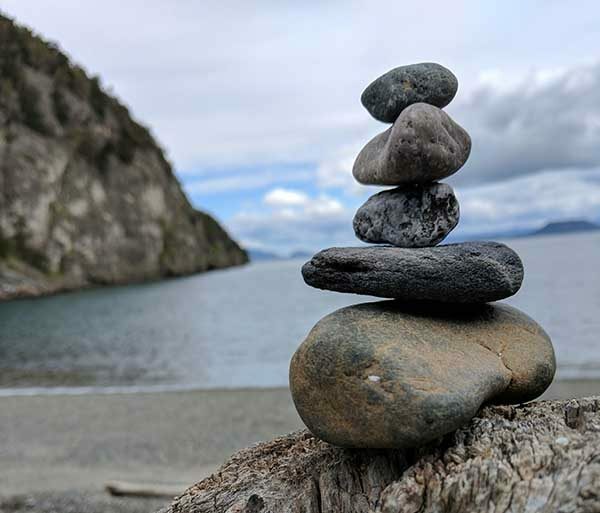 Cairns – aka ebenezers- are small stacks of stone that in many religious traditions are built in a place and left behind to represent to others that something significant happened in this place. As my friend and I walked through the school she was leaving, we laughed and told stories as she built these small stacks of stones that represented something, indeed, significant had happened in this place. 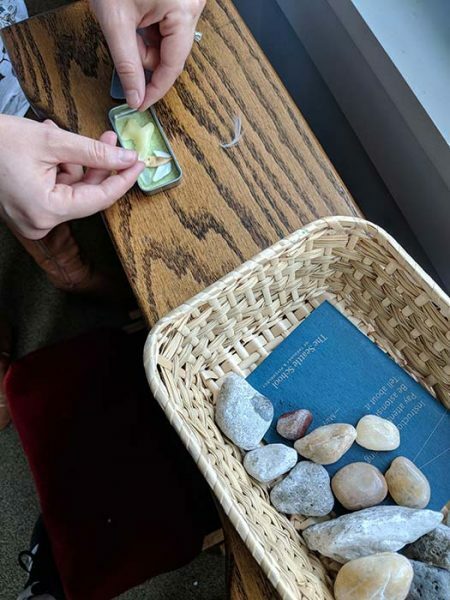 When we reached the exit of the building and the end of our ritual, I had the opportunity to bless and pray for my friend as she moved out of the doors and into the world, still a friend, but no longer a school–friend and no longer a student. Very grateful, for this post. It is a loving expression of moving beyond.